What do you eat on the eve of a dragon boat festival where you’re a competitive team about to race 6 races in 2 days against some of the top teams in North America? You’re probably thinking a low-fat, high-carb type of meal sounds about right. But when you’re Team Lifescan, our meal of choice was fried chicken and ribs. When we asked the concierge for directions to the restaurant, we were warned that farmerbrown was not located in the best part of town. When we looked at the map, it was hard to fathom because it seemed to only be 5 blocks away from our well situated SOMA hotel. What a difference a few blocks makes. Welcome to the Tenderloin district. 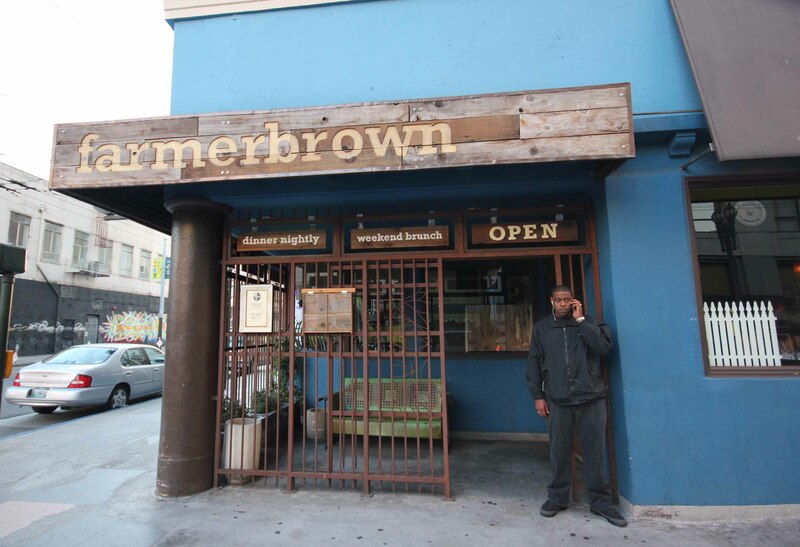 Farmer Brown with its security guards outside to keep the unsavories out. Inside the restaurant, we were treated to a fun experience of Southern soul food. I thought about being “good” for a moment and ordering the Seafood Jambalaya or the Summer Succotash. But who was I kidding, with things like fried chicken and ribs on the menu, how could I order anything else? I started with a Lemon Thyme martini and it was so good. The cocktails are definitely a highlight, but unfortunately I was racing the next day so I only ordered 1, (I did have a sip of a few others and they were all good). 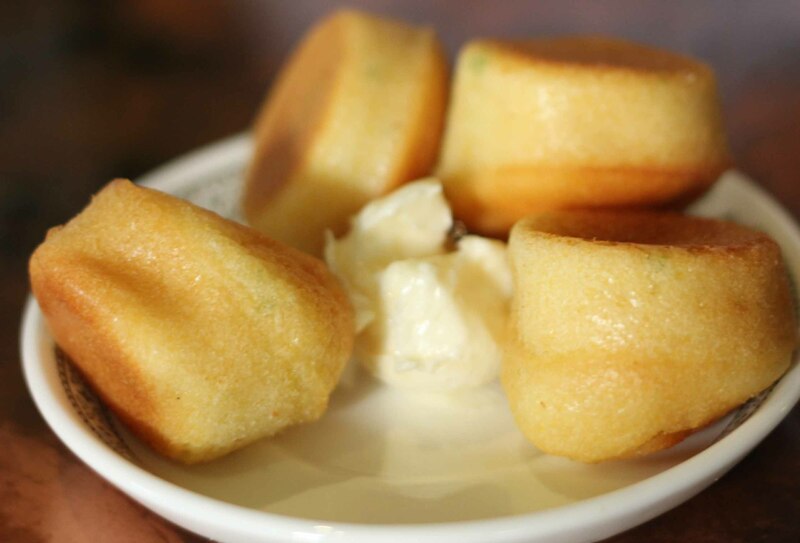 Moist mini corn bread muffins with sweet butter to start. 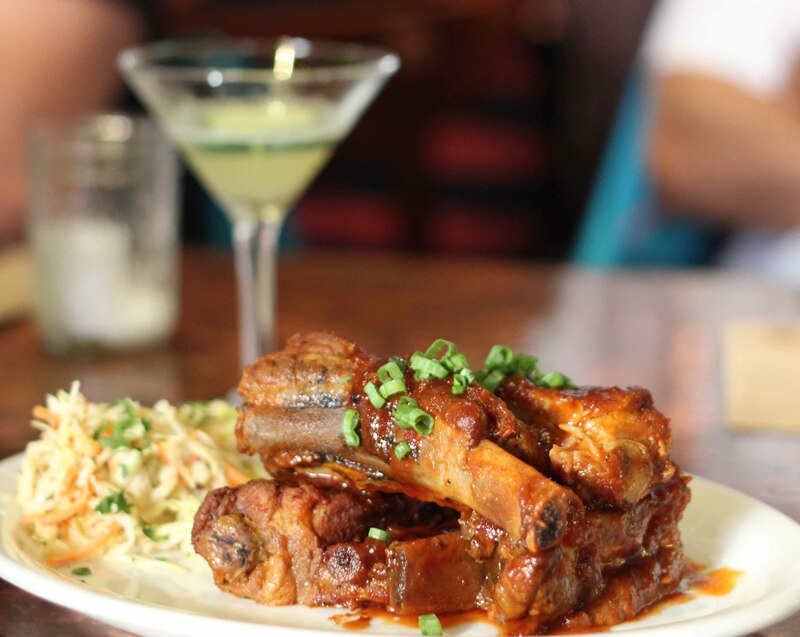 Fall off the bone Coca Cola glazed spareribs with coleslaw. The ribs were listed as an appetizer on their menu. I was lucky and saw someone at the table next to me being served this dish before I ordered, so I knew how big it was. I enjoyed the crunchy tangy mustardy coleslaw so much that I ate every last bite. The ribs were meaty and the sauce started out sweet but ended off with a bit of a kick on the palate. 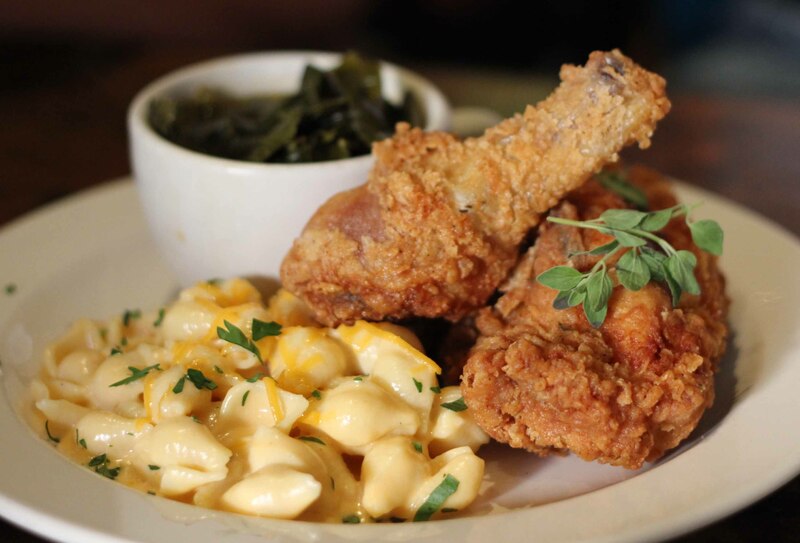 Fulton Valley fried chicken with ham hock greens and macaroni & Tillamook cheese. I was happy when my brother ordered the fried chicken. I really wanted to taste it, but knew that it’d be way too much food. But in asking to share, I knew I’d be stuck with a piece of the breast meat, (we’re both dark meat fans), but no matter. Even the white meat was succulent and the crispy skin was fried deliciousness. The macaroni was cheesy good, but I was expecting more ooey gooey-ness. I usually love Southern greens, I just couldn’t get past how watery and lacking good pork flavour these ones were. farmerbrown wouldn’t make my list if I only had 3 dinners in SFO because there are just so many more amazing places to eat here. But I am glad I got to experience it. I hear they have a great Saturday/Sunday all you can eat brunch for $16. What I would recommend though is to check out their sister restaurant, Little Skillet for lunch for the delight in the same fried chicken served with waffles.